Real Cards -These are the official Champions who were honored in the game during it's official run. 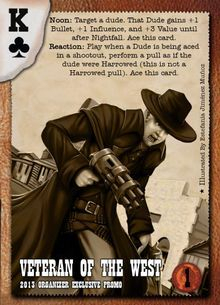 "Harrowed" Champions - Champions who won Major events AFTER Doomtown was no longer in print. 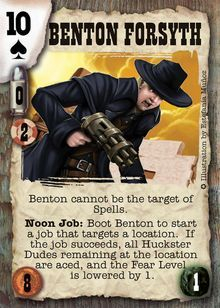 Tributes - These are people who earned a place in the Saints and Sinners Pantheon not by winning, but by exemplifying the Doomtown Community. 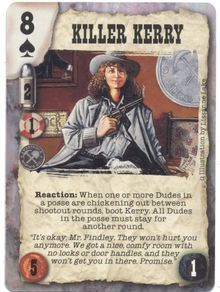 When Reloaded was announced Tim decided to give Classic a decent send off. 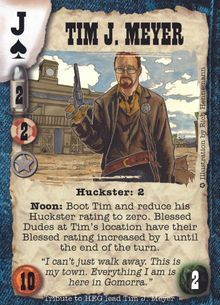 One fan was flabbergasted that Tim had never been immortalized on cardboard. That fan donated enough to buy the art and add one to every S&S set. 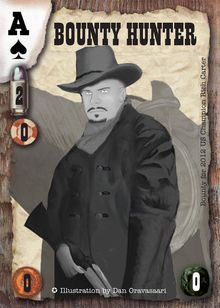 The character image for Doomtown Day's card: "Benton Forsyth" (As well as the Veteran of the west) is loosely based on Eric Jome. 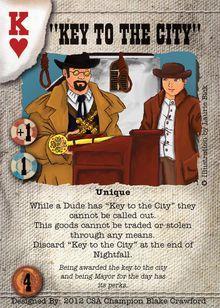 HEG's take on Mob Justice features Tim Meyer and David Orange as members of the mob. THIS IS NOT LEGAL TO PROXY. 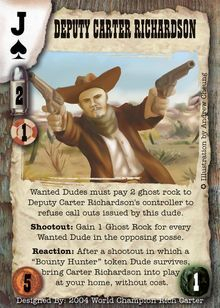 This card was printed on a normal card border and given away at Doomtown Day 2013. It is posted here to verify what it does and prove that it is a real HEG promo. 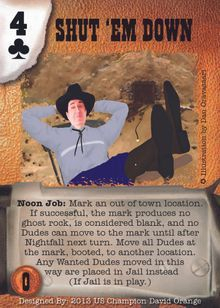 This card was printed on a normal card border and given away at Doomtown Day 2013 to people who helped with 2013 Events. It is here to verify what it does and prove that it is a real HEG promo. 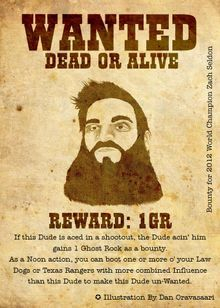 This event was run in 5 locations world wide with a rematch open to all players. 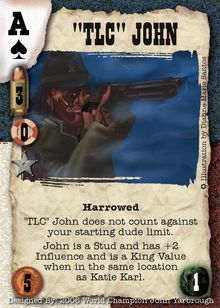 The losing faction received a new card! 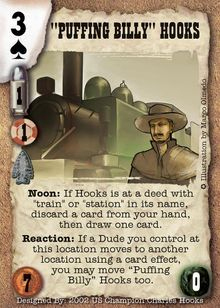 Due to a tie on Doomtown day, a rematch was held, and the participants got to name their favorite goods. A vote open to the whole community was then held. 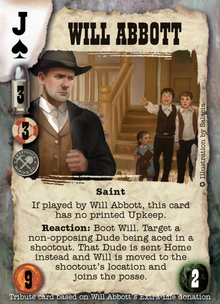 Rich Carter has chosen to hose the Whateley Family. 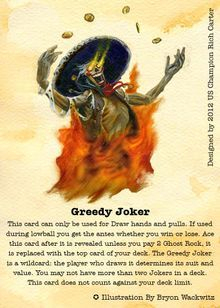 This Full art joker was given away during the 2013 tournament season and shows off the beautiful art of Bryon Wackwitz. 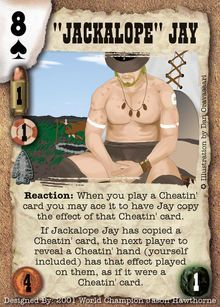 Please proxy the one with text so there is no confusion as to the card's ability. 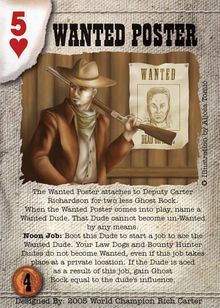 A stack of these was provided to Rich Carter to give away to opponent's fortunate enough to beat him. 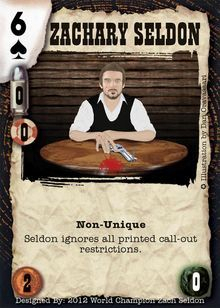 A stack of these was provided to Zach Seldon to give away to opponent's fortunate enough to beat him. HEG made wooden and Mon Backed homes of the homes they created and gave them out at various Tournaments. 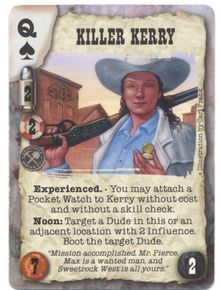 This was erroneously printed with a Saints & Sinners set but. 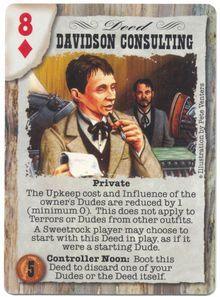 It is an official card, considered part of Do Unto Others. 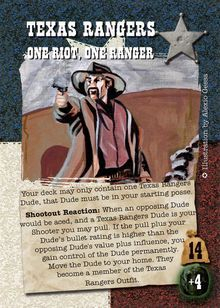 These are Formats HEG created or expanded, the cards belong to special sets just for the format. 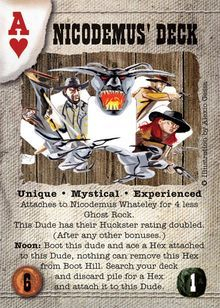 The Lost - These brave souls were unreachable, or never replied to HEG's attempts to contact them. 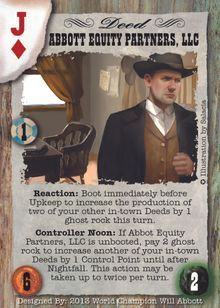 "The Champions Project" is a project by fan group "Harrowed Entertainment Group" that is dedicated to providing cards for the Champions who won after AEG stopped printing the game. 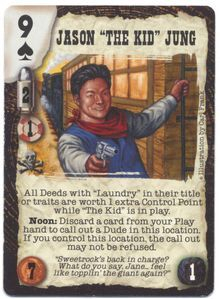 They are not produced or sanctioned by Alderac Entertainment Group, Although permission was obtained from John Zinser to release them as fan cards. 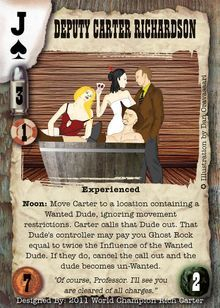 The cards have been playtested and reviewed. 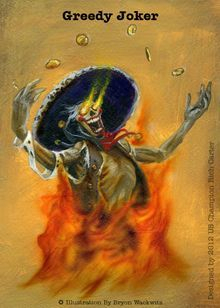 All art is owned by the original artist and was produced for use by HEG. 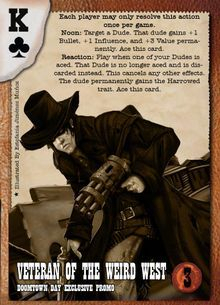 For casual play, it is up to you and your opponent if you can use these cards or not. 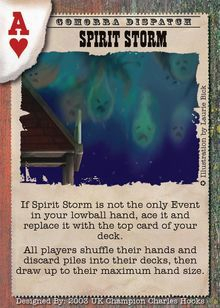 For Tournament play, it is up to the Tournament Organizer. 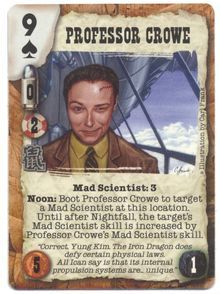 You will need to either proxy the card, print it and put it in a sleeve with a normal card, or see if your local copy shop can print it on a similar card-stock to real cards, then sleeve it into your deck. The Champions Project by Harrowed Entertainment Group is licensed under a Creative Commons Attribution-NonCommercial-NoDerivatives 4.0 International (CC BY-NC-ND 4.0) license. 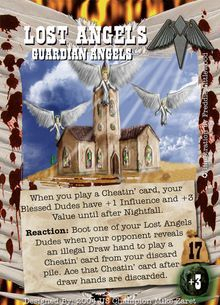 The card images above from Revelations and Do Unto Others are copyright Alderac Entertainment Group and are used without permission.